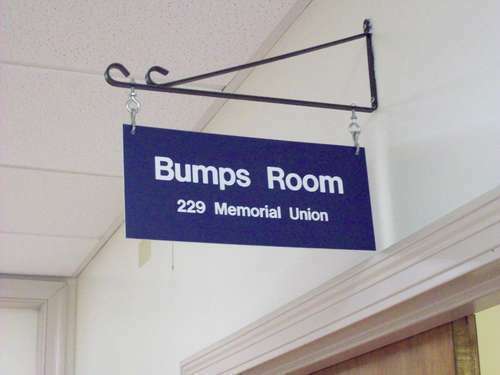 The John Bapst G/35 Fundraiser Tournament was played in the Bumps Room at the University of Maine in Orono on March 26, 2010. Thanks to Andy Bryan for contributing to this report. 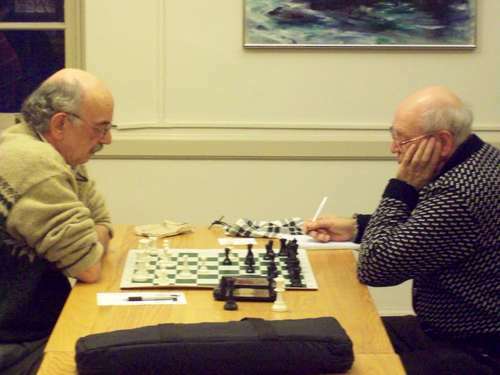 With the average rating of USCF 1527 at the Friday Night G/35, this John Bapst fundraiser had a very strong field despite only six participants. In the first round, the matchups were coach vs. coach (Riabkov/Abrahams), mentor vs. student (Sandford/Robbins), and teammate vs. teammate (Spencer/Power). In the closest contest Tom Sandford extended his hand for a draw as he ran into time trouble. Steve Abrahams continued his strong play defeating Yuri Riabkov in the middle game. Aaron Spencer defeated Deanna Power to conclude the first round results. In the second round, Abrahams defeated Spencer in his toughest match of the evening when Spencer pushed for the victory in a drawn position and Abrahams capitalized on a Spencer mistake. Abrahams concluded his perfect evening with a quick trap in his last match with Daniel Robbins. Each of the players had strong moments during the course of the games especailly Power despite going scoreless. 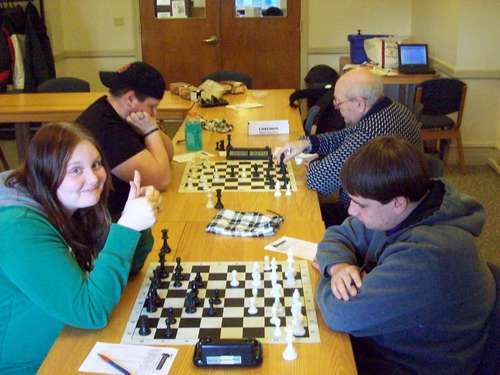 She pushed to the time limit in each of her games and all of her opponents remarking that she played well above her USCF 799 rating. The proceeds from this event will go toward the John Bapst team's sojourn to Columbus, Ohio to compete in the K-12 National Championships from April 16 - 18, 2010. 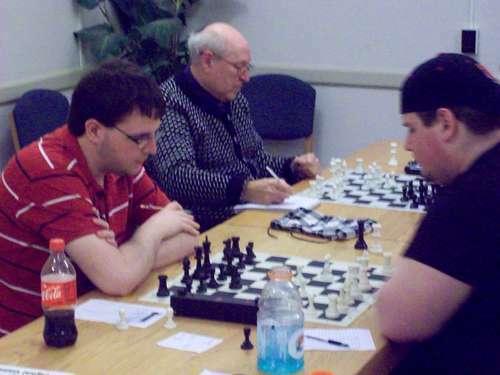 Bapst was runner-up to Bangor at the 2010 Maine High School Team Championships, and at the moment are the only Maine entrants in this national event. Good luck John Bapst in Ohio! 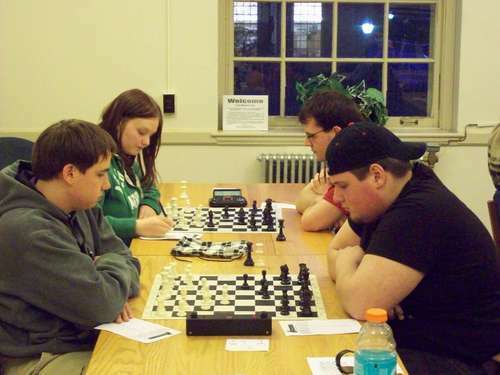 Touranamnet winner Steve Abrahams (foreground right) plays Aaron Spencer in round two while Deanna Power (background left) notates a move in her game vs Dan Robbins. 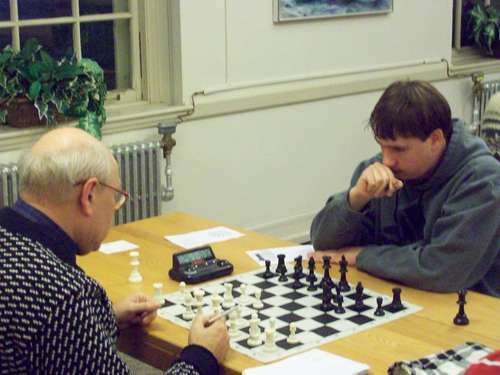 Clash of the coaches: University of Maine (George Cunningham) Chess Club Coach Tom Sandford (left) plays John Bapst High School Chess Club Coach Yuri Riabkov. Aaron Spencer (right) managed to win one from his coach in this third-round game. Deanna Power seems pleased with her position in her game with Aaron Spencer. Yuri Riabkov (background right) moves in his game vs Steve Abrahams. Dan Robbins considers his position vs Steve Abrahams. Thanks to all who participated and best of luck to John Bapst at the National K-12 Championships!